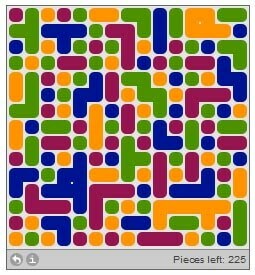 The popular igoogle game: Color Junction. A highly addictive game! You can play it here online. The object of Color Junction is to leave minimum number of pieces on the board at the end of game, by clicking on groups of 2 or more similar-colored pieces lying adjacent to each other. If you ever manage to empty the board completely, please leave a comment below! And here's more in Games! Let me know you visited me. Leave a comment! Get all my updates directly in your inbox. Get tips, ideas, humour, & recommendations. Get your weekly dose of inspiration and positivity. Get Exclusive BONUS Stuff every month! Please tick the box above to give your consent. Haven't played bejeweled on yahoo... did try it on zylom once, but cudnt figure it out! Let me chk it out again & see if it is the same thing. In this you gotta keep clicking the similar matched colors. But in bejeweled you gotta swap the gems to form similar matched gems to get points. Did u try out the other games here? wow lovely. 2nd game and its 0 pieces left. i like this one. Of the computer monitor that is. Pieces left: 4. Its diabolical. It will not let me win. Shame on u, OB! You haven't managed to clear the board even once in all these years? Tut tut! I swear I saw the pieces morph between moves. Pieces left: 8. Who? Who made this game? Bet it's a girl. A diabolical, evil female viper from the dark side of the 8th moon of Saturn. Pieces left: 7. I hate you. Arre, OB... looks like I missed replying to your previous comment! Hi! Please share your views/queries on this article here. You can comment with your Google Account (gmail ID). To receive email reply to your comment, check the "Notify me" box below the comment box. Writer. Blogger. Entrepreneur. An INTJ. I write about lifestyle, inspiration, food, books, entrepreneurship & my personal stories. Follow me for tips, hacks, ideas, humour, recommendations & loads of positivity! One Love is All I Need! Kaddu on "the Leash"... again! Caught in the Tangle of Names! All content on this blog is copyrighted.